-By far the best bait on the market! If you are into fishing, like we are, you know that different water types, weather conditions and seasons all call for different colors and types of baits. We know that the traditional angling worm has always been undefeated as a bait. We also know that anything good can be made even better! That´s why we´d like to present you BrightBait™, the shimmering green fluorescent live worm bait. The scent, movement, glow and bright green color makes Brightbait™-worms irresistible to the fish! Simply because the fish notices the bait easily when it can be seen better. It´s been shown that fish are very drawn to saturated baits that also glow. In the water, a glowing target dramatically increases the contrast compared to the environment. It is not possible to achieve such contrast just by using bright colors alone. The fluorescent feature in BrightBait™ uses daylight to be able to glow, even when it´s bad weather and the amount of light is low. That´s why the glowing BrightBait™ has been such a success story. We market ready-colored BrightBait™-worms here in Finland. Because the temperature where worms can be stored is limited, we cannot export live worms. We only export the color nutrient. The color nutrient is marketed in a consumer package of 30 grams. Consumer packages are great articles for retailers. The size of the package (30g) is just perfect for the consumer. With this product the consumer really gets something worth the money, because 30 grams of BrightBait™ color nutrient is enough to color about 200 worms. 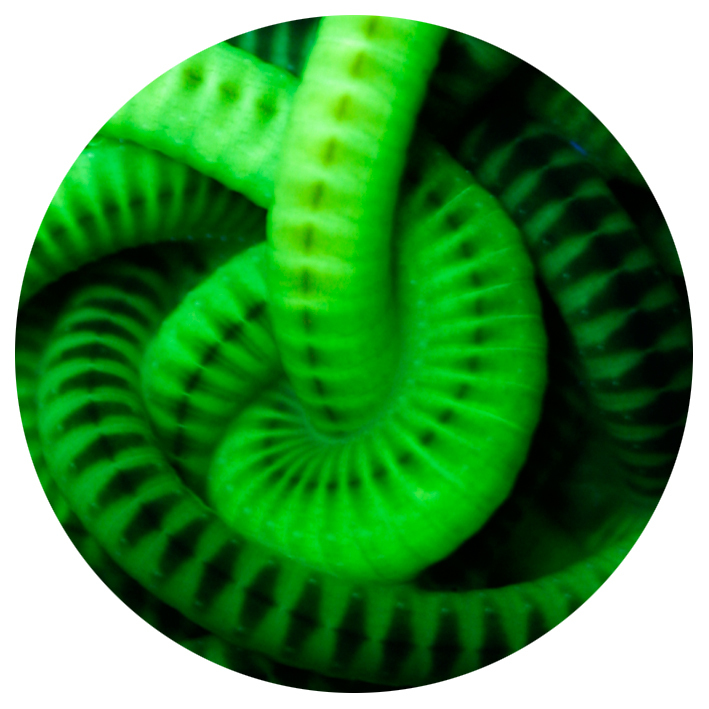 The purpose of BrightBait™ Fluorescent Color Nutrient is to color worms fluorescence green. Never try to color anything else with this product! First put about 1dl of fresh peat mould into baitbox. Then add approximately 4g (5ml) of BrightBait™ color nutrient along. Put a lid on the box and shake it so the peat mould and color powder get mixed. Next add about 40 worms into the box. Also add a little more (1,5-2dl) of fresh peat mould. Leave the box in normal room temperature (about 20°c) for one day (24 hours). During that time shake the box gently every once in a while. After one day the worms are colored fluorescence green. If you want the color to be stronger, leave the box to room temperature for a longer time. Maximum time in room temperature is altogether 2 days (48 hours). After this move the box into a cooler place (+5 - +12°c). 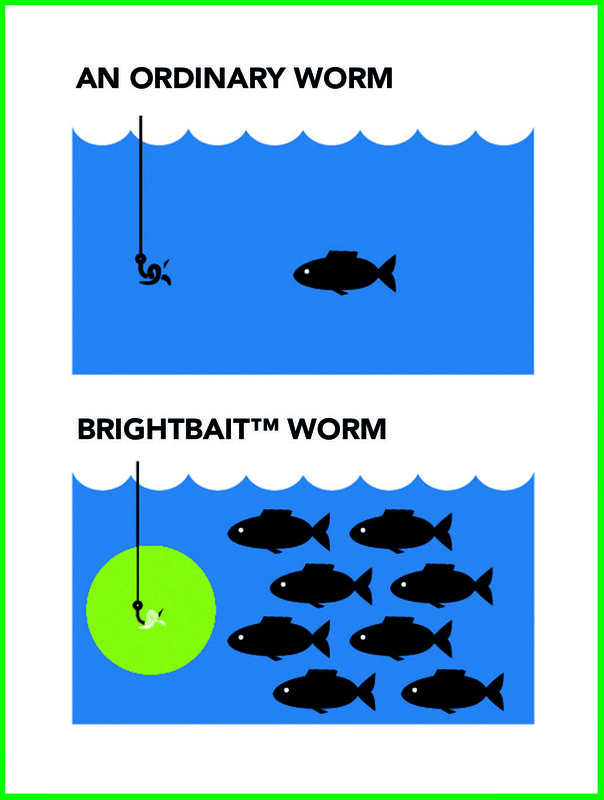 Remember that BrightBait™ worms are so called "daylight worms". This means that the fluorescence green color appears in daylight or UV-light. In artificial light the worms don´t look quite as shiny as in daylight. Try it and you´ll see the difference! Check out, how the worms should look like after being colored with our BrightBait™ nutrient. Under that link you´ll find a videoclip, which we filmed last summer outside in daylight. There are two breeds of worms on that clip, Dutch nightcrawlers and Canadian nightcrawlers (the bigger ones). European customers can get more information and place orders via e-mail. asiakaspalvelu@easyfishing.fi is the address to use! BrightBait™ Color Nutrient has been scientifically investigated and it causes no harm to the environment or to people when it is used as instructed. It has been developed in a University and it has also been studied by a well-known Finnish toxicologist. The demand of BrightBait™ -products has increased all the time. So, jump in and get this top product! Improve your (or your clients´) chances to have a successful fishing trip with BrightBait™! These unique fluorescent worms are the right tool to use if you want to catch some serious fish!